Each year for few days, Austin, Texas, also known as Silicon Hills, becomes the global capital of the entertainment and technology industry. We were at the heart of these events, we talked and listened. Between March 7 and 14, 2019, we participated in the South by South West 2019 festival (SXSW 2019). When jetlag dropped off, and the task-list enlargead by the absence at the company shortened, the time came to make a short summary. Among the hottest topics that were discussed both in keynotes on stages and in face-to-face conversations, it was impossible not to notice of how great importance the widely understood diversity is today. The leaders and entrepreneurs consider it particularly valuable in terms of building teams and organizational cultures. In direct conversations, the topic returned in many contexts. You can see how much importance today is attached to organising or building teams based on the model that takes into account primarily those who are or have been, to some extent, “discriminated” or excluded. Also in terms of technologies and developed ideas, there were solutions that could help eliminate any exclusion: AI supporting recruitment processes that will not be burdened with exclusions based on age, race or gender - this is the trend. One of the most interesting lectures I was able to attend was also a panel organized by Flourish (VC). Three CEOs of start-ups belonging to the Flourish portfolio participated in it. The common denominator of all three projects was their “social value” - a mission to help Americans who, for various reasons, struggle with financial problems or difficulties they face on the labour market. One of them was Steadyapp.com - an application helping to find an additional, casual job close to where you live. Despite a good economic condition, many people living in the US barely make ends meet. Statistics show that 43% of Americans work two jobs. The discussion of the representatives of solutions that could help in finding an additional source of income or reducing mortgage costs allowed us to look in a broader perspective at the personal situation of recipients of many technological solutions often created in isolation from the reality and the real needs of a large social group that goes far beyond the stereotypical citizen of the rich West. 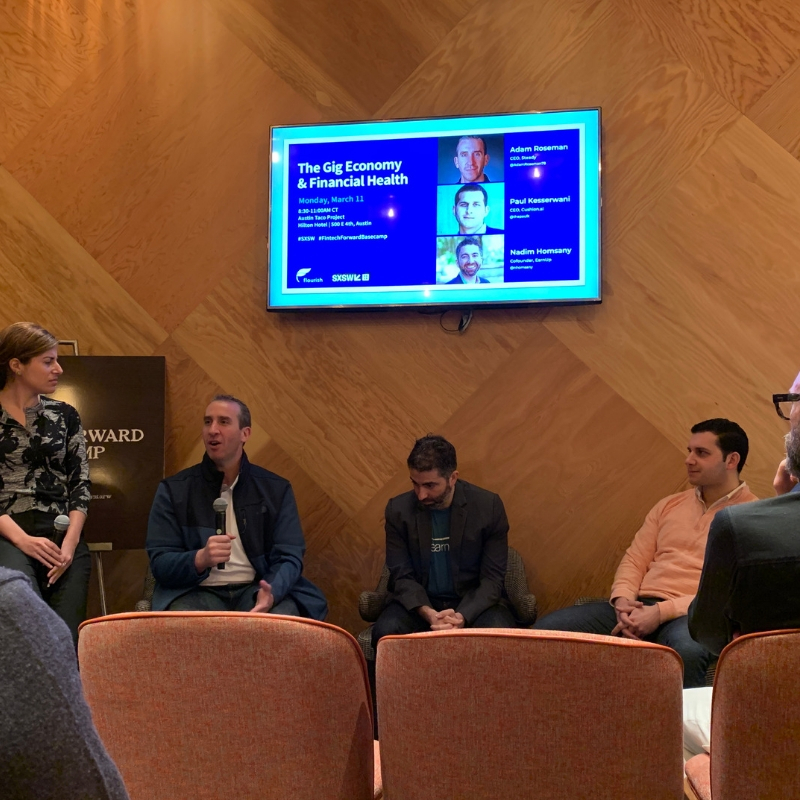 It was a very informative lesson followed by great discussions with Adam Roseman (CEO, Steady), Paul Kesserwani (CEO, Cushion.ai) and Nadim Homsany (Cofounder, EarnUp)! Implementing the whole year’s Naturaily on Tour, at South by South West 2019, we also appeared as exhibitors and at our stand we had plenty of opportunities to have brief and prolonged conversations with the fair visitors. SXSW is a huge festival focused on the entertainment, cultural and technological industries in a broad sense. For over a week, the whole city becomes a huge stage for thousands of events, concerts, meet-ups, and events in companies that have their headquarters in Austin. Open Doors Days in company offices of the start-up technology industry was a great opportunity for fantastic meetings. We would like to give special thanks to ObjectRocket, Skaffolder, Alpha and GetSportSpot for a very kind reception and to Emmalyn Shaw (Managing Partner at Flourish) for a nice talk. The festival takes place in almost every possible urban space, and local bars and clubs become a meeting place for specific tech-scenes from all over the world. BerlinSaloon convinced us with its exceptional hospitality and became our main networking base. Thanks to a multitude of side events and the presence of interesting people, also from the European technological scene, we often visited the BerlinSaloon, which was also co-organized by Mazovia Cluster ICT. Internet of Things industrial application development is one of the main areas of our expertise. Therefore, we particularly remembered Aashish Mehta and his project www.transferfi.com that we were able to get to know during the Innovation Competition. We keep our fingers crossed for further development! We also had the opportunity to have a great conversation with the representatives of the platform that enables the design of IoT products - Clearblade – a start-up company based in Austin, whose office we had the chance to visit. Industry level IoT products is the field that is particularly close to us. We are happy to see interesting solutions developed by specialists all over the world. Last but not least, I recommend you a recording from the panel discussion about the development of the podcast market with Spotify and Gimlet Media representatives on stage.